I love to share great books with you. Today, I have the privilege to refer you to Suzanne Eller’s latest book The Mended Heart. In her incredible writing style, Suzanne captivates the reader from the very beginning of this book. I would daresay that we have all experienced some kind of hurt or brokenness in our lives. This is a reality we cannot escape. Many have tried countless times and failed to “fix” the hurt. If you are masking the hurt and brokenness in your life then The Mended Heart is the book you have been searching for. I also love that Suzanne doesn’t just address this book from her opinion but has scripture verses that can help the reader’s pain and brokenness. Suzanne shines the light on God’s truth that Jesus came to set us free and heal our brokenness. This is not something we were meant to do on our own. The Mended Heart gives you the courage you need to take that first step to healing – trusting God. I highly recommend you take a look at the first chapter of this book and then order it today. Words can’t begin to express how deeply Suzanne’s words touched me. She is willingly sharing the message God has given her. Don’t live in hurt and brokenness anymore; trust God and let Him mend your heart. As a special bonus, Revell has generously offered to give a free copy of Suzanne Eller’s The Mended Heart to one of my readers. So, please share this on facebook and twitter as well as commenting below to say why you would like to have a copy of this book. I would love this book for our ladies bible study group. Lori, it would be a wonderful study for a ladies group. I would love to receive this book because we all have hurts that we need mended. I look at my life and see how many of those hurts have taken a toll. I want to be the one to fix them and not let God intervene.That is what I thought with my son. That I could fix it. It was something that God needed to be involved in. I stand and look at what God has done and the mending has certainly begun. Then I would share what I have learned with anyone else that was hurting. Thanks for sharing this wonderful new book. Blessings and hugs. Jeanie, I continue to pray for God to work in the relationship between you and your son. I know that He is working. This book would certainly be a help and a blessing. Lord, thank you for a mama who is willing to drop her “fixing” to find healing. Thank you that you love her son as much as she does, and so much more. That’s hard for us to grasp at times, and yet his name is etched on the palm of your hand. He has a plan carefully crafted by You. Give her the words to say and those to withhold. Draw her to a place of strength, prayer and hope through You. Pour into her peace and joy and rest so that she splashes out on all of those who live in her home. In Jesus’ name, amen. First, I would like to say I LOVE your new blog header! Is that the correct name for it? I’m the worst with technology. I would love a copy of this book to help me evolve from the hurt by using God’s truths. I am suffering from a broken heart due to an unexpected divorce. I’m shattered at how he was able to just move on and ask me to leave our apartment, entering into a huge city where I did not know a soul. It’s been a journey and each day I’m getting stronger. But the hurt is still there. Then the anger starts, which leads to thoughts of revenge. I know it’s not how God wants me to handle the situation. But, Jamy, it’s hard to pray for him and to let God handle it. Just being honest. I need a tool that can help me truly heal and heal God’s way. Courtney, thank you for the compliment. I am excited to see what God has in store for this new direction in my writing through my blog. I know the pain of an unexpected divorce. I will be certain to pray that God would give you the strength, comfort and healing you need right now. The Mended Heart would help to draw you closer to God and help you heal. Father, thank you that Courtney is not alone in her loss and her grief. Thank you that she can rest in you, and stay away from revenge which only leads to a path not designed for her. Hold her close. Watch over her. Lead her steps. Thank you that she is loved. Worthy. Wanted and created and loved by a God who loves His daughter. Fill these broken places with Your presence as she intentionally walks into a deeper relationship with You, the one who never leaves or forsakes. In Jesus’ name, amen. I was thinking, no wonder Jesus emphasized love one another so much, because we live in an evil world. Throughout a lifetime, a person can be heart by so many people they love and trust, that it is easy for a heart to become jaded and love grow cold. I’ve been one of those people. I would enjoy reading your book. Sometimes we just need to hear that everything will be ok, through someone else’s eyes. Whoever you choose, it will be a blessing to read “The Mended Heart”. Oh Jamy and Suzie, I read this post at the end of another very long day, all according to God’s plan I am sure, yet still long. I have spoken in previous comments about my grandson, Andrew. He is medically fragile and needs care 24/7. They told us he would not live 3 days when he was born on Ash Wednesday, 2008 and here we are after celebrating his 6th birthday on February 6th. He is in my class at school and preparing to go to 1st grade next year, fully included with his peers. His physical limitations have not hindered the Spirit he received from God! Our night nurse has been out sick for over 3 months so I stay to help my daughter and then head home every night with thoughts of the struggles, knowing that Andrew’s birth leading into Lent has always been to fulfill God’s purpose and to journey with Jesus to His Cross, His Death and to celebrate His Resurrection and the gift of New Life…but sometimes the road feels long even with my hand in His! I would love to read this book…it seems that even in His Faithfulness, I am always praying for more of His gift of faith and trust! Even in confidence, perseverance and hope, I am still weak and weary….thank you for giving me a place to share my brokenness. God bless! Now I will seek Him, pray to Him, He will listen and answer me….all in His perfect time! Amen! Ladies, thank you for sharing your thoughts and your prayer requests. Thank you, Jamy, for sharing this post. You are amazing. 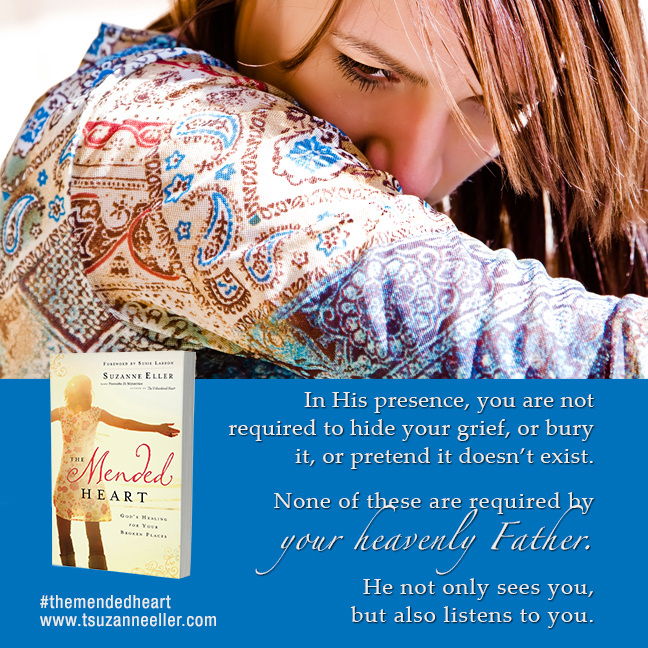 I pray you’ll join me at http://www.tsuzanneeller.com as we go through The Mended Heart as an online Bible study. I can’t wait to see you there!